Hey, Edmonton! Awesome Ideas Wanted for $1,000 Grant! What would you do with $1,000? That’s the thousand dollar question that Awesome Edmonton wants YOU to answer. 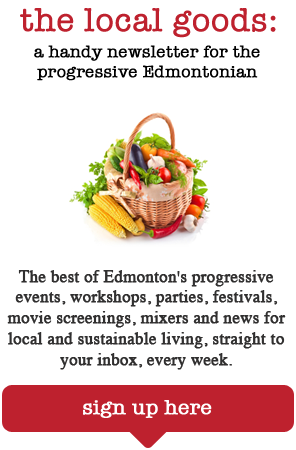 Awesome Edmonton is looking to give someone $1,000 in exchange for awesome ideas that make our community better. So no personal shopping sprees, hockey tickets, vacations, or ponies! They want ideas that will “spark an instant of joy and delight and inspire a long-term hope for a more awesome future.” What does this mean? It is up to you to decide! This is your chance to do some “local good.” You could use to the money to start your own local business to sell handmade products and food (cronuts are the latest trend! ), make art, start a festival, host a community block party, buy socks for the homeless, etc..
Inspiration is all around you! Edmonton is a city of makers (i.e artists, business owners, idea makers). The “Make Something” city, if you will. Take Stephanie Chai and our very own Local Good team member, Hannah MacDonald, for example. These two gals had an idea of throwing a party in a downtown parkade. Sounds kinda crazy? A little bit. But also, pretty awesome! So awesome that they won $1,000 to make it happen! In fact, just last month, they made their dreams come true! Their Parkade Party, held on Saturday, Aug. 31, 2013, was a huge success! How did those two girls get money? It’s simple. They submitted their idea to Awesome Edmonton. The trustees invited them to pitch their idea at the Pitch Party. Turns out the trustees and audience loved the idea so much, they won the money! And guess what? The $1,000 could be yours this month! Awesome Edmonton is looking for ideas for their September Pitch Party happening on Thursday September 26, 2013. 1. $1,000 in cold, hard cash. No strings attached. Seriously. The money is yours and you don’t have to pay it back. It’s not a loan. How awesome is that? 2. You have an opportunity to turn your awesome idea into reality! You have always wanted to do some local good, right? 4. You’ve got nothing to lose, everything to gain! 5. The chances of you winning the lottery is like next to nil. The chances of being awarded this $1,000 grant is like Josh Classen (Edmonton’s favourite weatherman) saying it’s going to snow in Edmonton in November —pretty high! Awesome Edmonton is made up of a group of 10 generous, community-loving trustees that donate $100 each month to make dreams come true. Since 2011, they have given away over $15,000 in grants! Past winners include: Love Letters to Strangers, a Free Photo Booth, People Powered Parties, Mercury Opera and iHuman. Too shy to submit an idea? That’s OK! Go to the Pitch Party and vote for your favourite idea! Free admission. The Pitch Party will be on Thursday, Sept. 26, at Pixel Blue College (Suite 200, 10080 Jasper Ave.) at 7 p.m.